Please note that all puppies are sold on a first come first serve bases. A $300.00 non-refundable deposit is required to hold a puppy. We are now accepting deposit through Paypal. PayPal payments are convient as they accept Visa, MC. Please note that 4% is added to the 300.00 deposit for using this service. 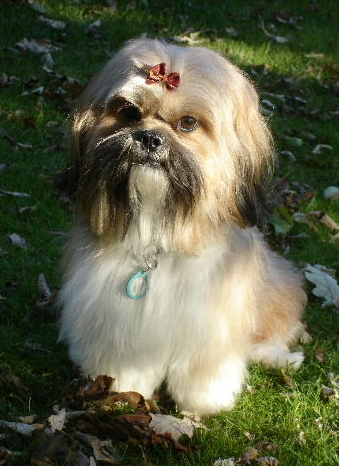 The price of our Shih Tzu puppies starts at $1200.00 and prices go up to 1500.00 depending on pet/companion puppies. Smaller puppies, solid or rare colors, Ch. pedigreed puppies, breeding or show quality will be more depending on the individual puppy. We realize that some breeders sell their puppies for less. However, we feel it’s important that you know that our puppies are not kennel raised, but raised in our home. This means that you are getting a much higher quality puppy and that an abundance of time and attention has been given to your puppy. Our price means that an abundance of time and attention has gone into making sure that your puppy has had the right start in life as all puppies should, and that the transition from our home to yours will go very smoothly. By the time you take your baby home, he/she is already accustomed to people, attention, everyday noises in the home. That may not sound like much but some puppies who are raised in a kennel are frightened and startled at the slightest noise because they’ve never been in the home environment, and they’ve never been exposed to home noises, people, love, attention, cuddling, snuggling and playing. Some kennel puppies will run from you because they don’t understand what the human hand is – some have never even been held! If the puppy has to stay after he or she turns 8 to 9 weeks of age for any reasons other then the breeder reasoning and for convenience of the buyer there is a 5.00 a day charge. Puppies are CKC (Canadian Kennel Club) registered with limited registration. Unless discussed and buyer and seller have come to another agreement which unlimited registration would be given. We NEVER sell to puppy brokers or pet shops. All puppies go to loving pre-approved homes only. In Short ..We Love our Dogs and they are part of our family . Our contracts must be downloaded before they can be printed. To download our contracts, please click the link below and the pdf file will open in your web browser. Please save the file. It will be saved in download folder on your computer and can be printed from there.